Folding and sliding door manufacturer NanaWall says its new WhiteOUT is the first glass wall system that can instantly switch from transparent to opaque. 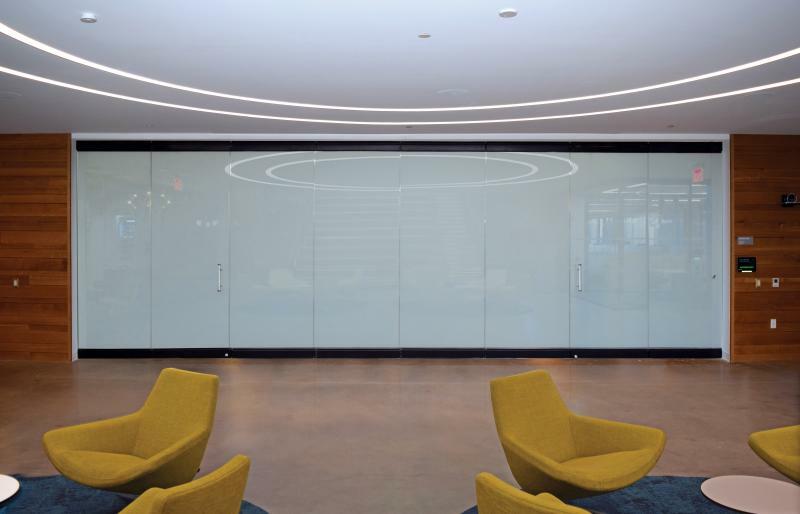 Ideal for residential or commercial applications, the frameless wall system uses dynamic glass—which typically uses electrical intervention to apply a tint or opacity—allowing the panels go from clear to white or vice versa at the touch of a button. NanaWall says the product provides privacy on demand without any vertical interruption since this all-glass system has no stiles. It’s also wireless and operates easily with a remote control, and the operation of incorporated swing panels causes no interference to the glass activation. The individual sliding glass wall panels are compatible with NanaWall’s RemoteSTACK feature, which enables architects to free up valuable space by stacking panels away from the opening. It gives architects control to design around structural obstacles and remove the panels from view, creating a solution that offers maximum space flexibility, the company explains. “Instead of stacking the glass wall within the opening of your interior office space, you can now completely move them to a hidden pocketed parking bay in the back of the room or even in a different room,” Nana says.